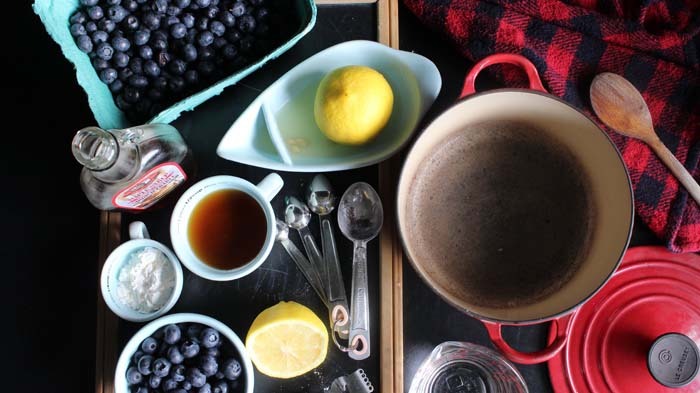 With blueberry season in full swing I've been wanting to try a recipe I found last year online from Vanessa of Hey Lady Grey which requires fresh blueberries. 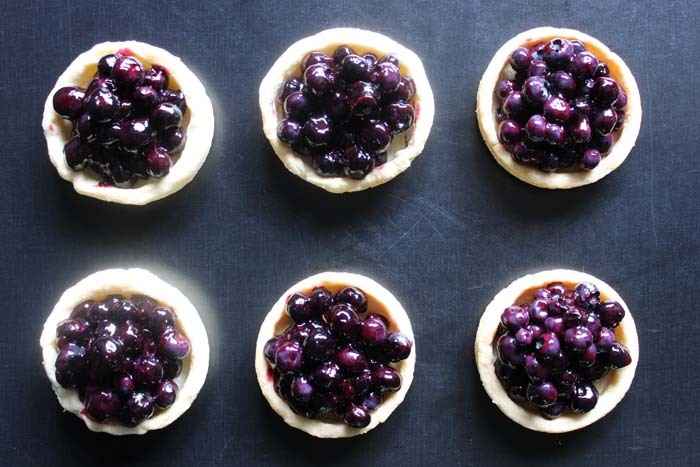 The filling uses a mixture of three quarters part raw blueberries and one part cooked. And as Vanessa describes in her post, "The next time you come across perfectly plump fresh blueberries, do yourself the biggest favour in the world and buy 2 pints. And then go home and make this pie! It's a game changer." I couldn't say it any better. Only to add about a hundred exclamation marks!!! 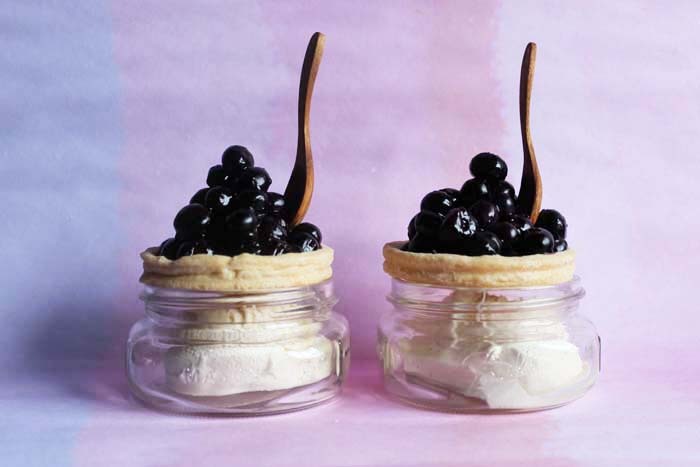 I've now made this recipe three times since the new blueberries have been out this season! We also made a fun hyper-lapse video to accompany the recipe! (Psssst! Did you know we have started to finally use our YouTube channel)? Click here to subscribe or see more! Also fun fact —listen for Earl's guitar solo! To make this recipe just a little more healthful, I exchanged the sugar for maple syrup and baked it on a gluten-free crust. 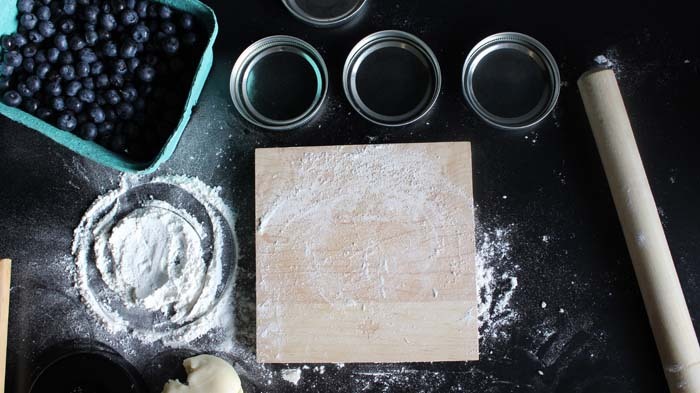 Also, making the crust in a mason jar lid makes for a perfect summer entertaining idea! 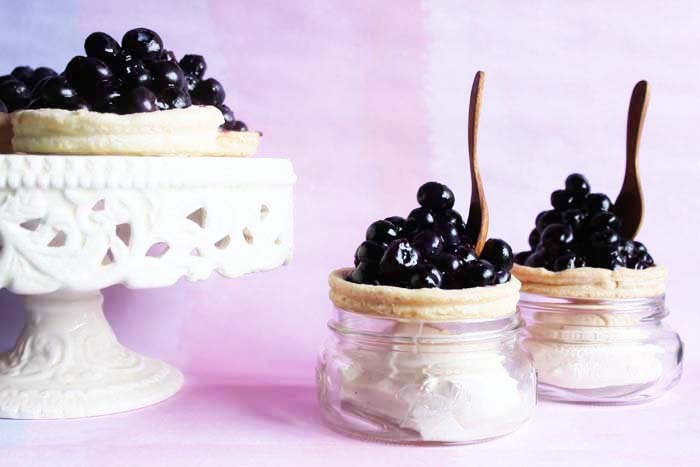 Dollop with whip cream or serve with ice cream in the jars and place the tarts on top! This dessert is a keeper and will be such a hit at your next summer get together! Promise! 4 baked mason jar lid tart shells (use your favorite pie dough recipe or see below for our gluten free recipe secret) —also see video above or read below on how we make the tarts. Separate out 1 cup of blueberries (choose the softest ones) and put them in a sauce pan with 1/2 cup of water. Cover and bring to a boil, then lower heat and stir frequently (uncovered) until the berries begin to burst and thicken (about 4 minutes). In a small bowl whisk the cornstarch with 2 Tbsp of water. Add this to the cooked berries, with the lemon juice, maple syrup and salt. Simmer for another 1-2 minutes (until mixture becomes translucent), then remove it from the heat and gently fold in the remaining 3 cups of raw berries. I've tried several gluten free pie crust recipes but have always found them to fall apart. So I found Bob's Red Mill Pie Mix earlier this spring (this is NOT a sponsored post), but it's the most amazing gluten free crust to make. So if you've ever had trouble making a gluten free crust, you might want to try this one. I use all butter in my version, although the instructions on the package tell you to go half lard and half butter. The idea of lard just doesn't sound good to me, so butter it is. And if you roll out the crust nice and thin, it comes out really nice. 20 Tbsp of butter (I use salted because I like the taste of the salt with the sweet filling —seems to bring out the flavours more). To make this dairy free you can substitute with cold vegan butter (or chilled coconut oil with varied results). Preheat oven to 400F. Pour 1 bag gluten free pie crust mix into a food processor (or bowl). Add 20 Tbsp of butter. Pulse 10 times, 1 second per pulse. * Pour mixture into a bowl. Sprinkle with 6 Tbsp ice water and mix until dough just comes together. Add up to 2 Tbsp more water if needed. Divide dough in eighths and flatten into discs. Wrap each disc in plastic wrap and refrigerate for 1 hour. Remove dough from the refrigerator. Roll dough into a 6-inch circle between two pieces of plastic wrap. Remove top layer of plastic wrap; and using a circle cutter one inch larger than your mason jar lids (approx. 5 inches —taking into consideration the depth of the mason jar lid), circle-cut the dough, remove excess dough. Invert dough into the 3.25-inch mason jar lids, remove plastic wrap and form the dough, pressing into the mason jar lids to get a nice formation of the lids on the crust (see above video). 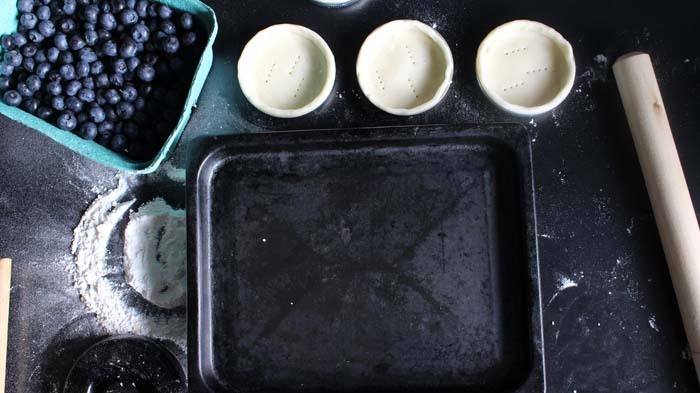 Bake tart shells for 20 minutes. Once cooled, remove shells from the mason jar lids and set aside. Gently pour the filling into the baked tart shells. Allow the tarts to sit at room temperature for at least 2 hours to set, before slicing into it. Psssst! Tastes best at room temperature. (I recommend not to refrigerate unless there are leftovers). 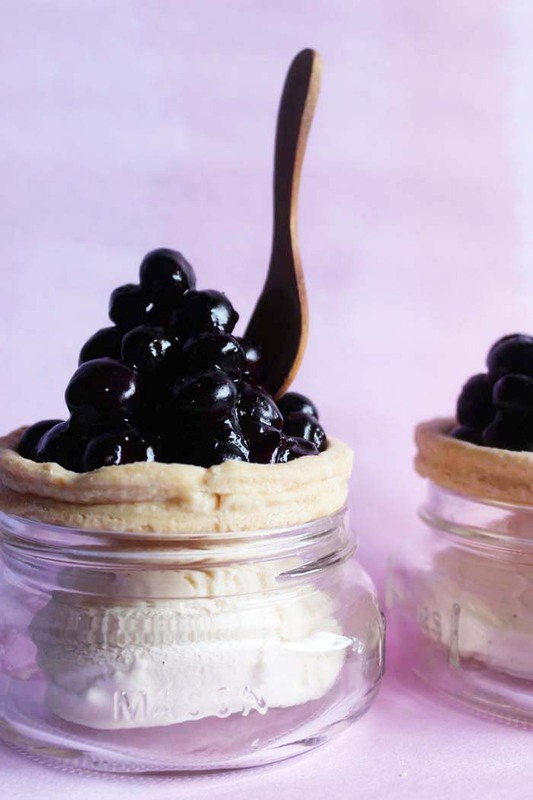 Top with a dollop of whip cream or for a cute entertaining idea, serve with ice cream (in the mason jar itself) topped with the tart as a lid! Love the video! And the healthy upgrades you made to it! Can't wait to try this! Brilliant!! I love the video.... so excited for more of these! Will you be pinning this to one of your boards? Your pin button is not working for me. Thanks. Lady Grey, Thanks Vanessa! Love that recipe!